As the natives around the globe are becoming mobile-savvy to an increasing extent, all the organisations into development are realising the fact that developing a mobile app is not just a luxury; it has become a necessity instead. Nevertheless, wishing to get an app and actually developing one are the two things stand apart. 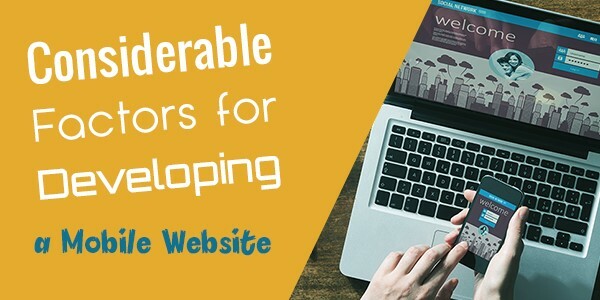 Even reputed brands and companies having a robust presence in online world find it a daunting task to get the mobile website development done. There is a need to understand the concept of an ideal app. An ideal app is often referred as a skillful blend of exceptional engineering and artistic design to offer wonderful user experience, which will further result into ubiquitous adoption. Considering the aspect of elegance is one of the key ingredients that a mobile app developer utilises for giving a magical touch to the end-product (application). There are numerous other factors need to kept as a note in order to make your app so much appealing that the user will automatically gasp the word ‘wow’ at the very first use of it. User Interface: The very first thing to be acknowledged is that majority of natives preferred for intuitive and simple yet appealing interfaces. If you will present a great idea with a poor-looking design, it will surely not leave an impressive mark on target audience. For making an impacting stance, the companies are looking forward to hire experienced designers who can create unique designs with their out-of-the-box thinking and innate creativity. It is always recommended to download some of the most extensively popular apps from the AppStore. By reviewing such apps, one can get the basic idea about the effective tactics and can provide valuable guidance to the developer. Additionally, it should be remembered that mobile apps comes with the flexible conventions of UI. Following the consistency helps in grabbing attention of massive users. Aspect of Touch: It is quite obvious that mobile apps/websites will be used by keeping them in hand. However, it is not all a bad idea to consider the parameters of touch and the ergonomic aspect. Just think like a user – how he will be holding his/her cellular device and most significantly, consider the positioning of thumb. This is the reason that most of the applications are designed with main menus and selectors at screen bottom keeping the close tab on the top. It is simply a great idea to use the visual cues for taking care of touch parameters. Variable Screen-Sizes: Firstly, it should be acknowledged that interface of mobile is much smaller than that of a desktop. So, you should avoid the interfaces designed for the bigger screens while working on a mobile app. Also, stay away from putting a great amount of content over a single screen. It can be a case that resolutions and screen sizes may vary as per the device type even if you are working for the same platform. Therefore, if you want to develop a mobile website having consistent look and feel, you should have idea about the target device so as to keep the design elements scalable. Battery Usage: It is a fact that majority of users avoid working on heavy websites due to the toll that they take from their cellular’s battery. For ensuring the minimal use of battery, it is always recommended to avoid the excessive use of animation and background themes, and also the location services. Be sure that you are not using the location services that need GPS. In-fact, do not include the tasks in background until and unless they are necessarily required because they use loads of battery power. Customisation: It is of supreme importance for a developer to work keeping user in mind. Every aspect should be considered as the user would do. It will help reaching customisation effectively. Moreover, seek help from a tech-savvy person to test the website/app you have designed. Don’t leave a single stone unturned- be it language options, theme, readability etc. Just like website development, an intelligently executed task in mobile development is sure to create a lasting impression on the minds of target audience. Hence, you must keep in mind the points highlighted above to come up with great apps. Author Bio: This article is written by Anna Brown, working as website developer with Xperts Infosoft. She likes to share her ideas with the novice developers who are seeking for a career into development. Connect with her on Facebook and Twitter to know more about her.